Goliath African Tigerfish (Hydrocynus Goliath) available for special order. Import from Japan from one of our suppliers. Please contact us for inquiries. 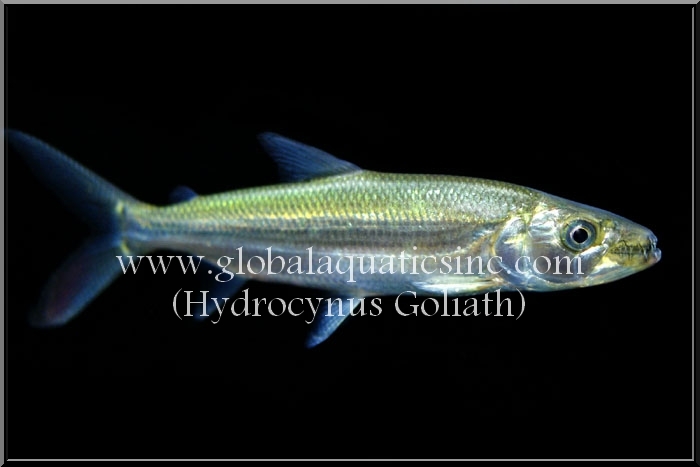 The Goliath Tigerfish (Hydrocynus goliath) is a member of the African tetra family, Alestidae. Being the biggest member of this family, it can grow to reach around 1.4m long. A native of the Congo River basin, the Lualaba River, Lake Upemba and Lake Tanganyika in Africa, it’s the largest member of the tigerfish clan, a genus of fierce predators with protruding, dagger-like teeth. Breeding: Giant tigerfish gather with other giant tigerfish of similar size. Small fish make large groups, and large fish make small groups. In the summer these fish migrate or move in rivers to find a place to spawn or release their eggs along the shores of lakes or the flooded banks of large rivers. Females scatter hundreds of thousands of eggs into plants, where they hatch. The adults give no parental care. No breeding in captivity have been reported so far. Feeding: Live fish. Some living in captivity would accept commercially prepared foods like larger morsels, shrimp, worms , larvae,beef heart. Maintenance: There is no need for any decor except perhaps a sandy base due to the speed and power of these fish. Water should be of the highest quality and well-oxygenated. It is a very active swimmer and therefore requires an absolutely enormous aquarium.